Get out your tissues - it's family visit time! Everyone ugly cries at the big reveal of their families coming out to Fiji. Addressing the elephant in the room (or on the island), Adam announces to everyone that he will not use his advantage to steal a family visit. Jay wins the rope wrangling obstacle course Reward Challenge and gets to hang out with his sister at BBQ and chooses Will, Sunday, and Adam to join him. Now that's good karma! 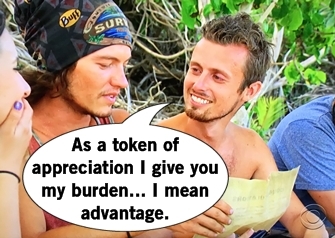 Adam continues the pay-it-forward lovefest and gives the reward steal advantage to Jay. It's all very bittersweet because Adam also hears from his brother that they stopped their mother's cancer treatment. I feel like everyone watching this episode used half a box of tissues during the first half hour. Zeke is feeling pretty great about having the numbers on his side to finally vote out David. Except Will becomes concerned that he won't get any credit for the moves he's made throughout the game if he makes it to the finale. Will decides getting rid of Zeke can be his defining resume item and begins to get others on board with his plan. Dude, you had such the perfect chance 3 days ago. Will tells new Legacy Advantage holder Ken that he's the target, and after Ken's ramblings of honor and integrity, he totally blows up Will's spot. All of Will's scheming is outed to the entire tribe. But no one is that mad at Will! Instead it's a fight to get Will on their side to regain controlling numbers. Tribal Council time! It's quickly discussed that there are two sides in this game and Will is smack dab in the middle as the swing vote. Will wants to be respected as an 18 year old man, but spend a large portion of Tribal Council cringing whenever there's a mention of his age or the "big boys". Zeke, Sunday, Bret, and Jay try to keep Will on their side, but there's some patronizing in their comments. David, Adam, and Hannah do a better job in pointing out how Will is being used and this is a great time to make a move. The begins to vote and Hannah seems to get the vibe again that it's her name on the parchment (question: is this a right instinct or something she says weekly?) 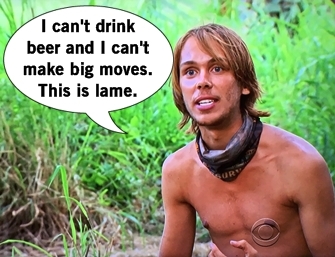 Concerned about a possible spit again, individual immunity holder Adam surprises everyone and busts his Hidden Immunity Idol right out of his crotch region. He plays the idol for Hannah voiding all 4 votes cast against her. 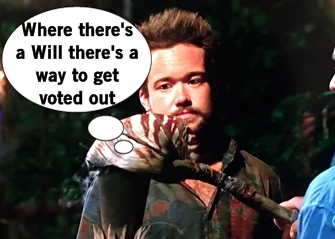 Turns out, Will did make his big move; Zeke is voted out of the game with 5 votes.